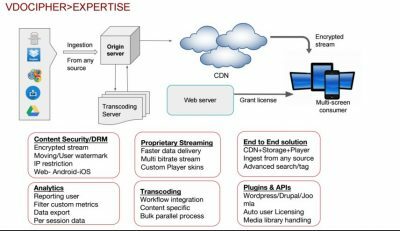 VdoCipher provides a complete DRM with encryption, backend licensing and viewer specific watermarking to safeguard video content. Sometimes owing to the rights and permissions to distribute a video, businesses look to white-list or blacklist content for certain geographies & IPs. Here is an API guide to do IP & Geo restriction for your VdoCipher account. This should allow you to configure any complicated setting of IP and country restrictions. Each matching rule overrides the previous matching rule. ipSet and countrySet are string arrays. Subnet CIDR block can also be set in ipSet string array. countrySet has two-digit country codes (ISO 3166-1 alpha-2.). Empty set matches everything of that type. The first part of above code will block your videos from playing in the mentioned IP addresses. The second part of the code will allow the video to play only in countries – UK & India. As mentioned in point 2 , the second rules is the dominant one for common users. Thus as an example, if some user has IP – 49.323.23.56 and resides in UK, his videos will not play. So various combination of codes can be used to create custom restrictions. If there is any confusion, drop us a mail and we can provide sample codes. Benefit of subnet restriction is that you don’t have to write specifically multiple IP addresses. You can configure it to restrict a group of IPs under subnet. API for setting IP-Geo restriction is the same as the video update API as provided in docs. *This feature is also present in dashboard. Please click on the top right circular button on any video to open video settings. In it, there will be an IP/geo restriction section. Using above documentation, you can add any restriction. Let us know at info@vdocipher.com for queries & doubts.